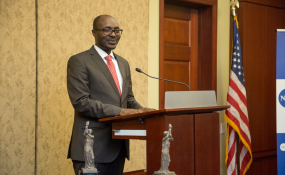 New York — The Human Rights Foundation (HRF) condemns the June 20 indictment of award-winning investigative journalist and human rights advocate Rafael Marques de Morais by Angola's Office of the Attorney General. The indictment came after Marques published an article in which he revealed and documented an illegal real estate transaction made in 2011 by Angola's Attorney General, João Maria Moreira de Sousa. Marques has been charged with "outrage to a body of sovereignty" under the Law on Crimes Against State Security and "insult against public authority" under the penal code. The journalist Mariano Brás Lourenço is facing the same charges for having republished the article in a weekly newspaper. If convicted on both charges, the journalists could face up to six years in prison. "For two decades now, Marques has been fighting to unravel the lies, scandals, and crimes of the dos Santos' mafia state. The dictator is manipulating national laws so that he and his henchmen are protected from the embarrassing truth," said Thor Halvorssen, president of HRF. "Marques' reporting has an immense influence on public opinion in Angola. His indictment, two months before the presidential election, promises that it will be nothing more than a façade. The dos Santos regime has no interest in accountability, freedom of press, or public debate," Halvorssen added. Marques is renowned for uncovering cases of corruption and human rights abuses by Angola's dictator, José Eduardo dos Santos, who has ruled the country since 1979. In 2011, Marques published "Blood Diamonds: Corruption and Torture in Angola," a book documenting hundreds of cases of torture and arbitrary executions in the country's diamond mining industry. Marques was later charged with slanderous denunciation and defamation under Angola's penal code and sentenced to six months in prison. Earlier, in 2000, he was sentenced to six months in prison under the Law on Crimes Against State Security for publishing an article entitled "The Lipstick of Dictatorship," in which he criticized the president and accused him of promoting corruption. This new indictment was issued on May 12, but the journalists were not notified until June 20, and were only given five days to file their defense. In addition to these charges, Marques is facing a lawsuit brought by the Attorney General in his personal capacity. Marques is charged with "abuse of freedom of the press" under the media law and injury and defamation under the penal code. Copyright © 2017 Human Rights Foundation. All rights reserved. Distributed by AllAfrica Global Media (allAfrica.com). To contact the copyright holder directly for corrections — or for permission to republish or make other authorized use of this material, click here.